“Maybe I’m actually getting a little smarter,” said Tom Cowley, describing his training habits over coffee on a late Sunday afternoon. The Gaithersburg runner was referring to a decision made the day prior. He had met his usual Montgomery County Road Runners Club (MCRRC) training partners for their weekly long run in preparation for the Boston Marathon. But a couple minutes before the run, Cowley felt his calf tighten up and chose to back off. Some runners call this listening to your body. It’s not at all that easy to do -even for Cowley, who has been running for 40 years. At 75, he’s this region’s oldest Boston Marathon qualifier. Monday’s race marks his third start in Hopkinton. Cowley qualified for the 2012 race but got injured. By now, he figures to have had every injury in the book.But each injury heals. And as soon as it does, Cowley’s back to it. “I miss the running,” he admits. Cowley’s Saturday training runs typically start in Bethesda. In the thick of marathon training, he goes about 22 miles – a distance considerably farther than his jogs back in the 1970s. He had been married for two years, he recalled, and had gained some weight. He and his wife lived in a small town in western New York. And somewhere out there, he remembers, there was a runner who went by the name of Jim Fixx. “He was a distance runner but I had no idea what that meant,” he said. Cowley liked to jog six or seven miles a day. “Back then,” he said, “I didn’t know I should take at least a day off.” Nor did Cowley know that casual jogging was not the best preparation for running a marathon. 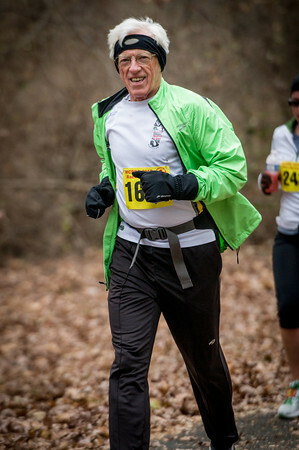 He is not sure when he joined MCRRC or when he ran his first marathon. Cowley, frankly, is not one for stats, or to stress about times. He ran for many years, in fact, before starting to overhear folks talking about this “thing called AG.” And it was many years after that, even, before he would catch wind of “BQ,” and that someone would tell him after one marathon that he had attained one. Cowley had never realized that the Boston Marathon breaks down qualifying times according to age groups. So he ran his first one in 2006. Ran it again in 2011. So why does Cowley run? Instead, Cowley trains on – six times per week, plus three gym workouts. He does track work on Tuesday, takes the next day off, does a quicker run on Thursday, goes long on Saturday, and on the other days covers six to 12 miles. And while Cowley does not consider himself “fast,” his BQ of 4:15:04, run in September at the Wineglass Marathon, is 25 minutes below the qualifying standard for his age group, and would also qualify him in the 70-74 division as well. Cowley credits his marathon education to MCRRC’s pace groups, and fondly remembers the advice he received from the late Mike Broderick, a club member and coach. Cowley, meanwhile, has no interest in racing short. Cowley, in fact, is now considering November’s JFK 50 Mile Run.